I’m trying to remember where I read that report that said that Ben Affleck literally got down on hands and knees and begged Kevin Smith for a cameo in Clerks II. Oddly, I can’t seem to find it anywhere online! Funny how a rumor starts, isn’t it? I do remember reading the rumor, but there probably isn’t much truth to it. A Kevin Smith without an Affleck cameo is like a day without sunshine. Actually, what I heard is that Affleck was invited to come back to the Askewniverse, but accepted only under the terms that he would be in the background and not play one of his previous Kevin Smith-created characters. After a while on set, Affleck felt it was weird to be there and not have a line, so Smith forged one for him on the spot. I’m sure not unlike a childhood game of "Telephone," the message got jumbled along the way – but I was having so much fun with the idea that Jared had severely stepped up his operations beyond simply physical beatings, I couldn’t turn my back on it. 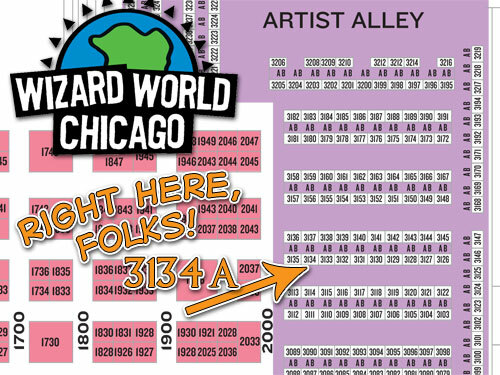 Clerks II commentary aside, I wanted to take a moment to talk to you about Wizard World Chicago coming up in two weeks, August 4 – 6 at the lovely Rosemont Convention Center right next to the fabulous (and always on-time) O’Hare Airport. This will be my thrid year going to Wizard World Chicago and I’m hitting the ground running. I will have copies of my new book "Theater Hopper: Year One" for sale and I’m going to try and pass it around to as many members of the media that I can. To help generate interest, I am having a book-launch party in my hotel room on Saturday night, August 5. It’ll probably start around 7:00 or 8:00 and go until we either run out of beer or get bored and want to go somewhere else. But the idea is not only to celebrate with fans, but to let the media know that web comics are a happenin’ scene and that Theater Hopper ain’t too shabby on it’s own! I need to let you know that Zach Miller from Joe and Monkey will also be releasing a book (Volume 2 of his hilarious comic) that weekend and the book release party is a joint effort. There will also be several other web comic stars in attendance. Not only at the party, but on the convention floor. The Theater Hopper booth can be found in immediate proximity of Gordon McAlpin of Multiplex, Joe Dunn of Digital Pimp Online, illustrator extraordinaire and convention stalwart Taki Soma and the previously mentioned Zach Miller. It’s going to be a hell of a time. If any of you happen to have connections in the comic press, web comic press or small press publication… press, please let me know so I can notify members of the media in advance. I’m not looking to get signed by any production house or anything. Pretty much just looking to network and inform people about Theater Hopper. I can’t tell you how many conventions I go to where people look at my booth and say "So it’s online?" They’re not expecting it. 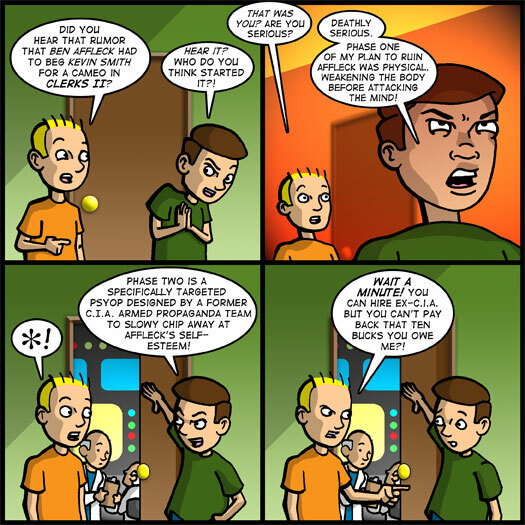 I feel it’s time to get over the hump and bring web comics to a wider audience. With book in tow, I hope to make that happen! I will have more news to share about Wizard World Chicago in the coming weeks, but I wanted to start talking about it now. I hope to see several of you in attendance and I thank you for your support! Thanks again to everyone who has helped to make this possible. I finally feel I have something concrete to exhibit at Wizard World Chicago and that I’m not just there taking up space to say I had been there. It’s a good feeling! Did you hear that rumor that Ben Affleck had to beg Kevin Smith for a cameo in Clerks II? Hear it? Who do you think started it? That was you? Are you serious? Phase one of my plan is to ruin Affleck was physical. Weakening the body before attacking the mind! Phase two is specifically targeted psyop design by a former C.I.A. armed propaganda team to slowly chip away at Affleck's self-esteem. WAIT A MINUTE! You can hire ex-C.I.A. but you can't pay back that ten bucks you owe me? !